Prepare for FNP practice with the latest evidence-based guidelines! 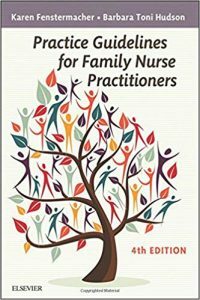 Practice Guidelines for Family Nurse Practitioners, 4th Edition provides essential information on current assessment and management protocols for primary care patients of all ages. Key details are easy to find, with the book’s concise, outline-style guidelines and abundant summary tables and charts. And you’ll be ready to manage care more effectively with the latest information on topics such as pain management, bariatric surgery follow-up, restless legs syndrome, and new medications for diabetes and cardiovascular disorders. Written by expert nurse practitioners Karen Fenstermacher and Barbara Toni Hudson, this guide equips you for the conditions most commonly seen in primary care settings. Essential, evidence-based guidelines provide the latest guidance for management of disorders commonly seen by FNPs in primary care settings, including information on which problems must be referred to a physician and which constitute an emergency. Quick-reference tables and charts include pediatric conditions charts, comparative charts for similar disorders, and health maintenance guidelines charts.Coverage of special populations assessment provides quick access to information on adult, pediatric, and geriatric assessment.Compact size and spiral binding make this guide easy to carry and easy to use in the clinical setting.Full-color insert provides an illustrated, quick reference to common skin disorders.Concise outline format makes it easy to locate essential information quickly. NEW! Treatment guidelines include the latest nationally recognized evidence-based treatment guidelines, including those for dementia, asthma, and diabetes. UPDATED content throughout includes bariatric surgery follow-up after release from surgical care, assessment of pelvic masses, restless legs syndrome, the advanced eye examination including advanced staining techniques, and new medications for diabetes and cardiovascular disorders. NEW Pain chapter provides guidelines on pain management and caring for patients with pain.NEW Laboratory and Diagnostic Pearls chapter offers useful laboratory and diagnostic tips that the authors have accumulated over years of clinical practice.NEW! Coverage of respiratory and ENT disorders is presented into two separate chapters, reflecting how these problems are actually handled in clinical practice.NEW user-friendly design includes an improved outline format, easier-to-read tables, and color highlighting for essential information.